This new modern system brings you the future of entrance doors at your finger tips. Keys, cards and codes can be lost, forgotten or passed on - your fingerprints can't! Access is gained by the swipe of any finger which then activates our popular ML120, ML3120 & ML480 automatic multipoint door locks. Mains power needs to be provided, all other hardware and electronics are provided in the kits available below. The scanner unit features anti-tamper protection and can store up to 99 users. ML-E-STD-KIT - This KIT includes the electronics you will need to add to a new or existing ML120 / ML3120 / ML480 locking system when you already have an access control system in place. ML-E-BIO-KIT - This complete KIT includes the electronics & biometric components you will need to add to an existing or new ML120 / ML3120 / ML480 locking system. ML-E-BTBIO-KIT - This complete KIT includes the electronics, biometric & blutooth enabled components you will need to add to an existing or new ML120 / ML3120 / ML480 locking system. Please note: none of the above KITS include the lock or keeps, these are purchased separately and can be viewed on our 'Single Door Locking Options' section or 'Double Door Locking Options' section. Unrivalled Convenience, your key is always on hand! It is impossible to lock yourself out! User Friendly, Easy installation and administration. Maximum Security, No lost or stolen keys, maximum protection against forgery. Intelligent Software, The intelligent software is learning all the time - it can detect the growth of children's fingers as well as minor injuries and change to users' habits. Complete Control, Alter the relay times, set the LED intensity on the scanner and much more, you can control all aspects of this system. Below is a video demonstrating how easy it is to program the system using the control panel unit located within the door, please note this is for reference only, the actual products may differ slightly from the one shown in the video below, please refer to the 'Coastal biometric fingerprint entry system installation / operating instructions' document below. The video below is a brief overview of how to setup and programme the door entry system using your mobile device and the ekey home app only available with the ML-E-BTBIO-KIT, there is more information from the installation / operating instruction manual which can be downloaded using the link below this video. There are detailed information PDF's regarding the locking system below. 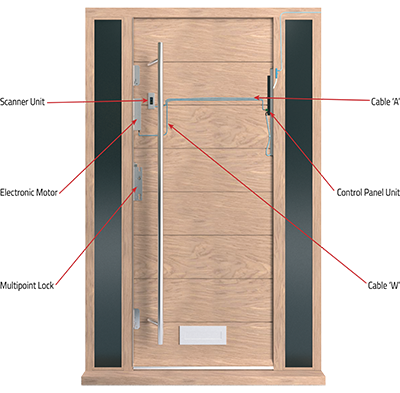 Click here to check the 'Door Lock Handing Diagram' prior to ordering. Click here to view the MK39 / MK7 Keep Installation Drawing. Click here to download the Coastal biometric fingerprint entry system installation / operating instructions relating to ML-E-BIO-KIT & the ML-E-BTBIO-KIT. Click here to download the blueMatic wiring guide relating to ML-E-STD-KIT. Electronic Biometric Locking Kit for the 'Vogue' ML120 & ML3120 and the 'Heritage Plus' ML480 Automatic Locking Systems, can also be used on the 'Solo' ML320 & ML330 Double Door Kits. This is the complete kit incorporating the electronics and biometric components but EXCLUDES door locks and keeps. 1 x ML-E-BIO-FPSU - Biometric Finger Print Scanner Unit Integra. 1 x ML-E-BIO-FPSFP - Finger Print Scanner Face Plate - Stainless Steel. 1 x ML-E-BIO-CBLA - Cable A, Finger Print Scanner Unit to Control Panel, 3 Meter. 1 x ML-E-BIO-CPU - Control Panel Unit Complete with Cable Transmission. 1 x ML-E-EMTR - Electronic Motor. 1 x ML-E-CBLW - Cable W, Electronic Motor to Control Unit, 6 Meter. 1 x ML-E-PSU - 240v to 12v Power Supply Unit. Please Note: This KIT does NOT include the ML120, ML3120 or ML480 locks or appropriate keeps. We do advise that the products electronics are installed by a qualified electrician. These items are special order items (non-stock) so there will be a few days lead time from point of order. Electronic Biometric Locking Kit incorporating Bluetooth for the 'Vogue' ML120 & ML3120 and the 'Heritage Plus' ML480 Automatic Locking Systems, can also be used on the 'Solo' ML320 & ML330 Double Door Kits - This is the complete kit incorporating the electronics, biometric and bluetooth components but EXCLUDES door locks and keeps. 1 x ML-E-BIO-BTFPSU - Biometric Bluetooth Finger Print Scanner Unit Integra, door can be opened and programmed via the ekey home app available on Android & iOS devices. 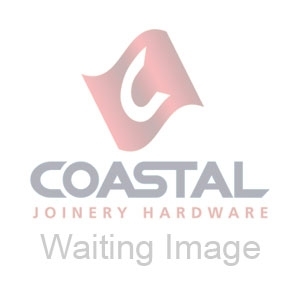 Electronic Locking Kit for the 'Vogue' ML120 & ML3120 and the 'Heritage Plus' ML480 Automatic Locking Systems can also be used on the 'Solo' ML320 & ML330 Double Door Kits - This is for use when the customer already has an access control system in place. 1 x ML-E-CFU - Cable Flex Unit. Please Note: This KIT does NOT include the Biometric components, ML120, ML3120 or ML480 locks or appropriate keeps, we also advise that the products electronics be installed by a qualified electrician.